How much do you know about the U.S. health insurance landscape? In this post, we’ll discuss three basic aspects of U.S. health plan payers: type, geography, and size. Understanding these aspects will help you design a study sample that is representative of your market. The percentage of uninsured children has declined since CHIP was implemented. Under the ACA, children are covered, even under dental insurance, under the more affordable of plans. In our last blog entry, we identified the top reasons some states have decided not to move forward with expanding their Medicaid programs in 2014 (“State Decisions on Medicaid Expansion Still Unfolding”). Since the June 2012 U.S. Supreme Court ruling that made Medicaid expansion under the Affordable Care Act optional for states, the economic implications of the expansion have been key in each state’s decision. In this entry, we’ll discuss these economic implications and how they may affect hospital revenues and healthcare manufacturers. The expansion will move some U.S. residents from private insurance to Medicaid, which pays providers at lower rates. However, this loss for hospitals would be offset by Medicaid payments from the much greater number of previously uninsured patients who will be covered under Medicaid, to the tune of $2.59 gained per every dollar lost from private insurance payments.5 Hospitals are also expected to reduce uncompensated care costs (such as those often incurred in the emergency room), as these patients – if they are U.S. residents – will now be covered by Medicaid. 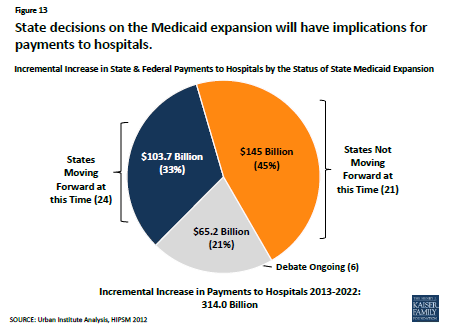 States that don’t move forward with expansion will retain their current federal funding for Medicaid programs, but will experience reductions in other federal funding. For example, the Affordable Care Act requires a reduction in funding for disproportionate share hospitals. In other words, they will take these cutbacks without the offsetting gains from Medicaid expansion. How might the expected increase in Medicaid payments for many hospitals affect healthcare manufacturers? We know that hospital Medicaid payments are expected to increase significantly as millions become insured in states that go forward. Additionally, the Affordable Care Act will expand state benchmark benefits packages to include ten broad categories of essential health benefits, including ambulatory care services, lab services and prescription drugs,6 that will likely increase market access to products and services (see table below for the full list7). This increase in hospital payments could be a boon for manufacturers of medical devices and drugs used extensively in the hospital. For example, the increase in patient census will correspondingly increase demand for medical devices, imaging procedures and pharmaceuticals currently administered in the hospital. Medical device manufacturers might find a more welcome audience for a high value-added product, especially if the product generates offsetting cost savings and delivers measurable improvements in care that can translate into publicly reported outcomes. However, this expectation should be taken with caution. As hospitals serve more patients, costs of direct care as well as facility maintenance and repair will increase. Many hospitals have been struggling financially for years, and revitalizing their own financial health may take higher priority than paying for high value-added products. Where do states stand on state Medicaid expansion? In this post we discuss the most recent changes and identify reasons why states are deciding not to move forward.